As Halloween is just around the corner (where on earth does the time go?!) 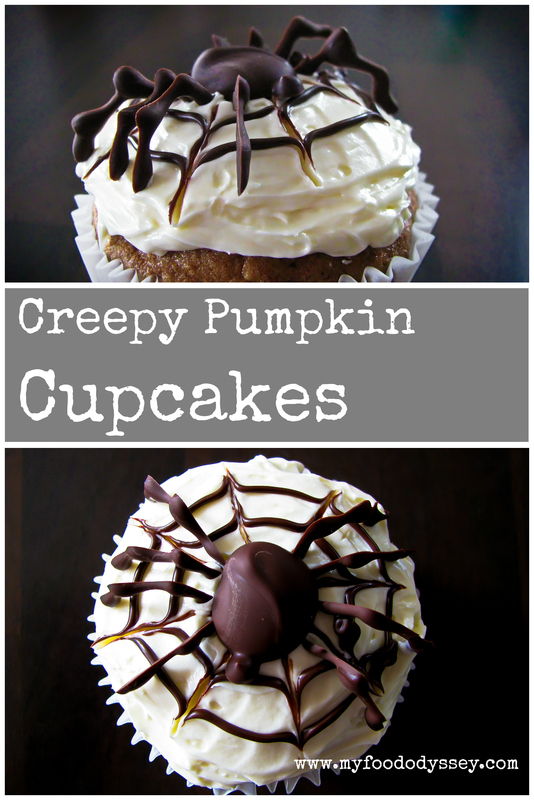 I thought I’d share these creepy and delicious pumpkin cupcakes. Making the spiders is fantastic fun and will keep the kids occupied for hours! The cupcake itself is so moist from the pumpkin – a bit like carrot cake, but even better! Pumpkin is widely available at the moment but if you can’t find it or you’re not a fan you could substitute butternut squash or even carrot. I created these cupcakes for a competition I entered some time ago. As part of the entry I created an accompanying step-by-step video, which you can find here. I make the spiders using dark chocolate both because I prefer the taste and because I think the dark chocolate contrasts better with the white icing. However, you can certainly use milk chocolate if you prefer. I haven’t tried these using white chocolate but I imagine that the chocolate itself is not strong enough to hold its shape, so I wouldn’t recommend it. Making the spiders is a bit of work, so if you don’t have little helpers you could just create the webs and leave out the spiders. Or, you could use spider-shaped sweets – there are lots of good Halloween sweets available in the supermarkets at the moment. Note that in the video I have included egg whites in the frosting. However, I prefer the frosting without egg whites, so I have left them out here. Pre-heat the oven to 180˚ C (355˚ F). Put the nuts into a food processor and blitz until roughly chopped. Remove to a separate bowl and save for later. Put the sugar, oil and eggs into the mixer and blend for about a minute until slightly thickened. Add the flour, bicarbonate of soda, salt and cinnamon. Mix for about 1 minute. Remove the blade from the mixer. Add the raisins, chopped nuts and pumpkin. Fold the new ingredients into the batter. When the ingredients are well combined you are ready to fill your cupcake cases. The mixture should be just beginning to fizz from the bicarbonate of soda. You need to move to get the mixture into the oven while the baking soda is working. Pour the batter into cupcake cases. Bake for 18-20 minutes until golden brown and a cocktail stick inserted in the centre of a cupcake comes out clean. 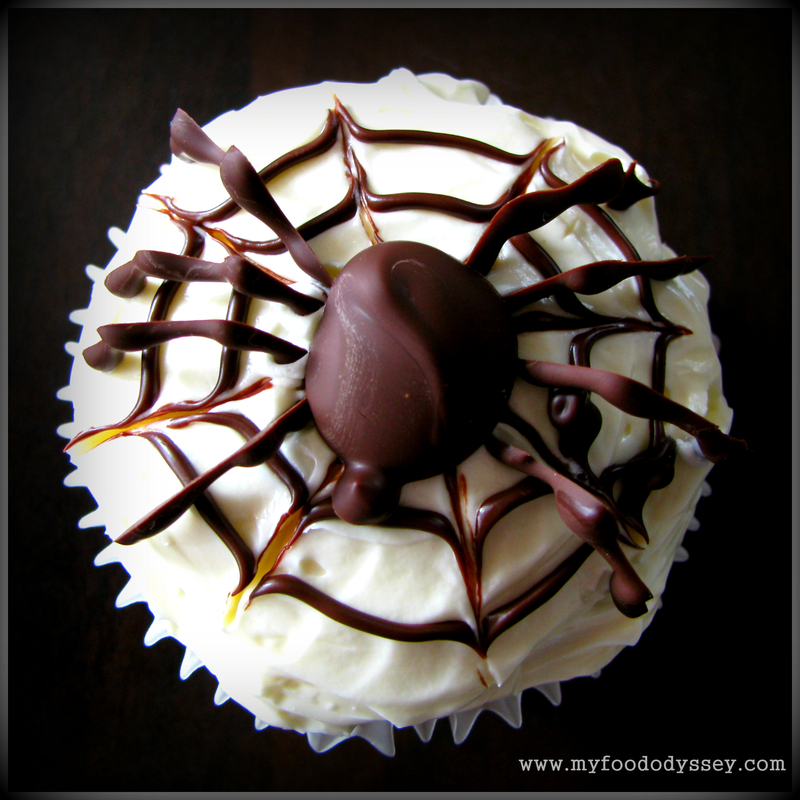 I’ve topped my cupcakes with chocolate spiders. If you plan to use these, make them while the cupcakes are cooking and cooling as they take some time to set. If you plan on making the spiders I strongly recommend that you watch the video, available here. It’s actually not as complicated as it looks and even if they don’t turn out quite right the kids will have a blast making them. However, if you don’t fancy making them you could use spider-shaped chocolates or sweets or other Halloween-shaped sweets which are widely available in supermarkets at the moment. Melt 100 g (3.5 oz) of dark chocolate in a bowl over a pot of gently simmering water. When the chocolate is full melted and smooth, remove from the heat and allow to cool – it’s too hot to handle just yet. Draw two small dot about 5 mm above each line, one about 5 mm from each end. (The dots are just visible in the video.) These will be the points for the “knees” of each leg. You don’t need to be too precise with this – as long as the legs are arched and not straight lines you will be able to stand them up to create your spiders’ legs. For the body, first draw around a penny, then add a small circle above as the head. Lay the baking paper on a baking sheet or other firm surface so that you can move it to the fridge once you’ve piped your chocolate shapes. Spoon some of the melted chocolate into a piping bag fitted with a “writing” nozzle. If you don’t have a piping bag just use a disposable food bag, as I have in the video, using a cocktail stick to put a very small hole right in the corner of the bag for piping. Use a 5 mm piping nozzle (or cut a 5 mm corner off a separate food bag) to create the bodies. Use the bag with the small hole for the heads. Place the baking sheet into the fridge for at least 15 minutes to allow the chocolate to set. Put the sugar into a mixer. Whisk until the mix is thickened and holds its shape. Ice the top of a cake, making the top as smooth as possible. Use the bag with the small (cocktail stick) hole, draw three circles on top of the icing – one small one in the centre, then two bigger circles moving towards the edge of the cupcakes. Using a clean cocktail stick, gently draw from the central circle to the edge of the cupcake to create the individual sections of the spider’s web. When your spiders’ bodies and legs are well cooled, create a spider in the centre of the web. First, add a body. Then add four legs on each side, pushing gently into the icing to hold in place. 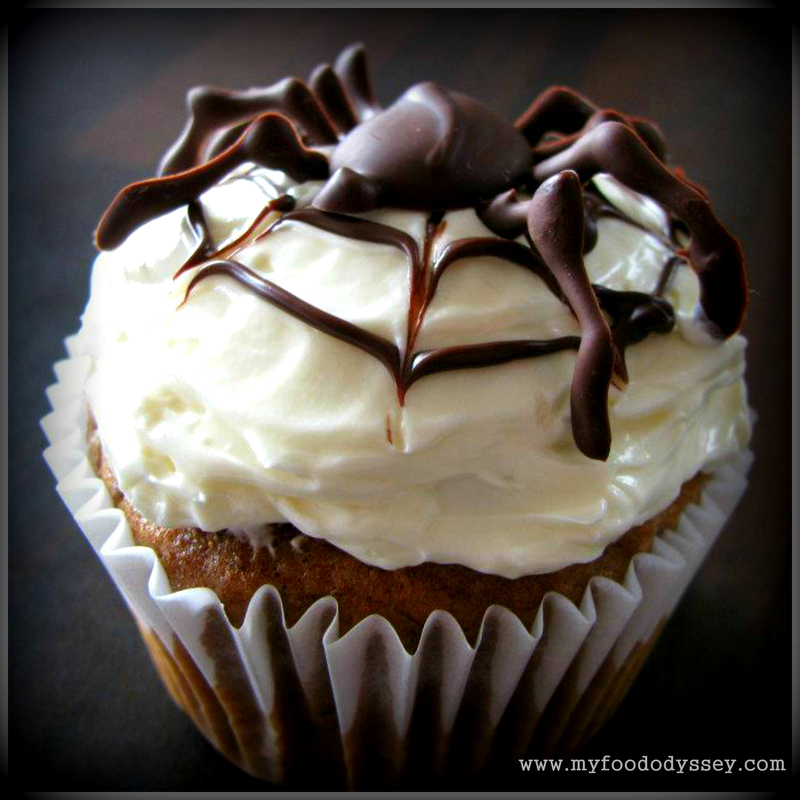 And voila – your finished cupcake with spider’s web and spider! 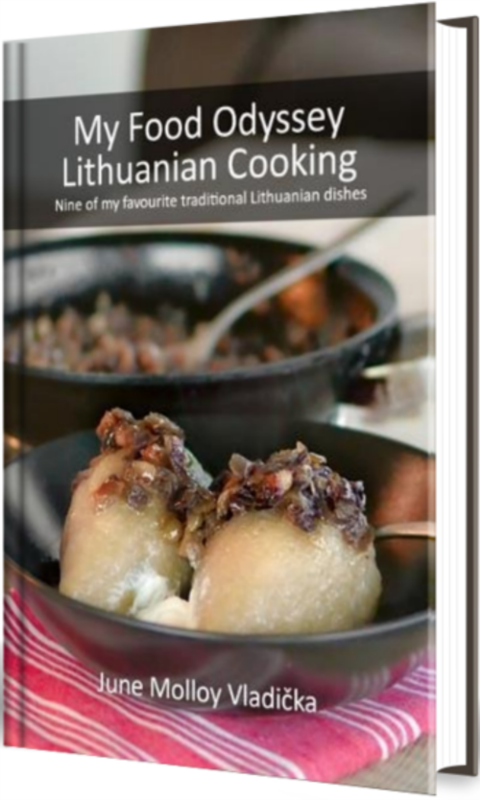 These are such fun – I really hope you give them a go! If you do try them please let me know how you get on – I’d love to hear your views! Enjoy! June, I’m going to link this recipe to Una’s Guitar Girl page if that’s OK as part of our Halloween campaign! Absolutely – please do! I watched the video on her Facebook page the other day. It was brilliant! The song was stuck in my head for days! Thanks! Yes, she is absolutely brilliant – should be on CBEEBIES or something! Very creative and they sound yummy as well! Thanks for stopping by my blog. Why is there no “absolutely love it” button??? WP, get your act together! Thank you, ma’am! And you know your cakes!